Robert Whittaker has the “anything you can do I can do better” mentality when it comes to Kelvin Gastelum. Whittaker will serve as a coach on season 28 of “The Ultimate Fighter” Gastelum will be the opposing coach and both men will likely collide sometime next year. The holdup has to do with Whittaker’s hand surgery. “The Reaper” says he hasn’t even begun the rehab process. “The Reaper” was last seen in action last month. He took on Yoel Romero in a non-title five-round affair. Whittaker won the bout via split decision in a “Fight of the Year” worthy battle. Whittaker broke his hand in the fight. He didn’t defend his title because Romero failed to make weight. Gastelum earned his title opportunity after going 4-1, 1 NC in his last six outings. Wins over former UFC middleweight champion Michael Bisping and Jacare Souza helped boost Gastelum’s case for a title shot. There was an argument for Chris Weidman to get the next middleweight title bout. The “All American” defeated Gastelum, but the problem is inactivity. After submitting Gastelum, Weidman had to undergo two thumb surgeries. He hasn’t fought since July 2017. On top of that, he is 1-3 in his last four outings. Weidman is currently the third ranked UFC middleweight, while Gastelum is just behind him at the fourth spot. 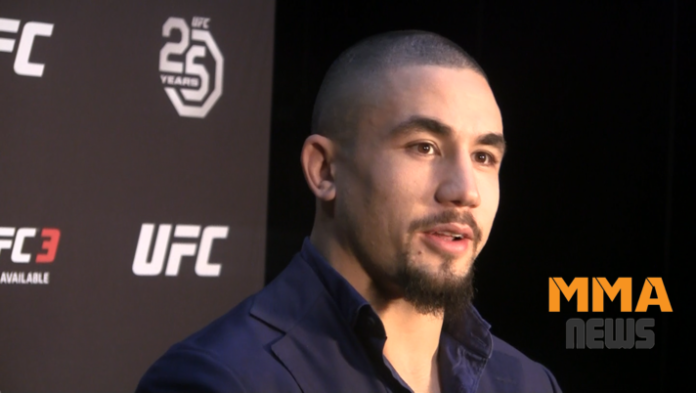 Do you think Robert Whittaker has the edge over Kelvin Gastelum? Sean O'Malley, Nicco Montano, Marvin Vettori, and Augusto Mendes have been handed their sanctions by the U.S. Anti-Doping Agency (USADA).